With the rapid development of the field of cardiac biomarkers comes a need for updated guidance on how to use them clinically. Drs. Adams, Jaffe, and Apple meet that need with this timely reference. Taking a case-oriented approach for the greatest clinical relevance, the book bridges the gap between science and practice. If you use – or want to use – cardiac markers such as BNP and troponin to help your patients, you will find this clear and comprehensive reference provides a dependable source of valuable information. The authors cover the technical, clinical, and outcome assessments for each marker used in clinical practice. 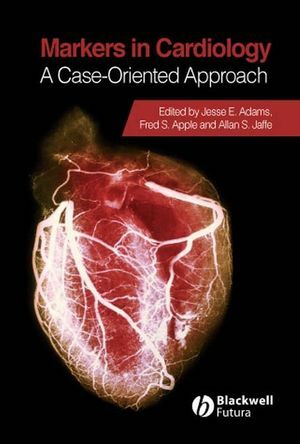 After each case scenario, an extensive discussion explains the clinical decisions and provides valuable context. 1 Basics of cardiac troponin: practical aspects of assays, potential. analytical confounders, and clinical interpretation. Fred S. Apple (University of Minnesota School of Medicine). 2 Diagnostic use of cardiac troponins in ST-segment elevation. Susanne Korff (Medizinische Universitätsklinik Heidelberg), Hugo A. Katus (Department of Cardiology), Evangelos Giannitsis (Department of Cardiology). 3 Therapeutic implications of cardiac troponins in ST-segment. elevation and non-ST-segment elevation myocardial. Tracy Y. Wang, John M. Castor, L. Kristin Newby. 4 Ischemic heart disease in the absence of overt coronary. Allan S. Jaffe (Mayo Clinic). 5 So you think you have a “false positive’’ troponin?. Jesse E. Adams (Jewish Hospital Heart and Lung Institute). 6 Use of cardiac troponin in patients in non-ischemic pathologies. and exposure to environmental toxins. 7 Cardiac troponins in patients with congestive heart failure. Jesse Adams (Jewish Hospital Heart and Lung Institute). 8 Troponins and the critically Ill patient. Jose Antonio Perez (Mayo Clinic & Medical School), Luciano Babuin (Cardiovascular Division & Cardiovascular), Allan S. Jaffe (Mayo Clinic). 9 Cardiac troponins and renal failure. Suresh Pothuru (University of Maryland), Christopher deFilippi (University of Maryland). 10 Cardiac biomarkers: detection of in-hospital myocardial. 11 The future: interpreting new guidelines for myocardial. 12 Basics of natriuretic peptides: practical aspects of assays,. potential analytical confounders, and clinical interpretation. Alan H.B. Wu (San Francisco General Hospital). 13 Natriruetic peptides in clinical practice. Alan Maisel (University of California). 14 Outpatient evaluation for cardiovascular diseases using. Aaron L. Baggish (Massachusetts General Hospital), James L. Januzzi (Harvard Medical School). 15 Natriuretic peptides in patients with renal failure. Peter A. McCullough (William Beaumont Hospital). 16 Congestive heart failure: treatment implications of natriuretic. W Frank Peacock (Emergency Cardiology Research). 17 Utilizing multimarker strategies in patients who present with. Johannes Mair (Universitaetsklinik fuer Innere Medizin). Part 3 Contemporary markers of risk. 18 Clinical integration of C-reactive protein for primary and. 19 Lipoprotein subfraction analysis using nuclear magnetic. William C. Cromwell (Presbyterian Center for Preventive Cardiology), Harold E. Bays (L-Marc Research Center), Peter P. Toth (Director of Preventive Cardiology).